I’ve never been drawn to middle grade books. I think by the time middle grade literature actually became good, I was an adult. It took me long enough to realize YA lit was fabulous, and as my friend Trisha says, I seem to not trust people’s opinions and have to experience stuff on my own…slowly. Over the past year, I read three middle grade books that I really wanted to share. They all deal with loss to a certain degree that is age-appropriate and encourages discussion and critical thinking. Plus they are all beautifully written. In January, we had Gary D Schmidt visit the junior high where I teach. 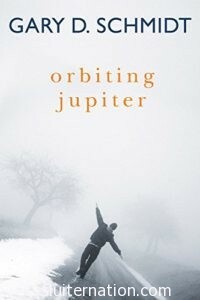 All 8th and 9th graders read his book Orbiting Jupiter in preparation. Because I knew I would be teaching it, I read it in two sittings the summer before school started. The story is told from 6th grader Jack’s point of view. His family takes in 8th grader Joseph as a foster kid. Joseph has had a sorted past: he has an abusive father, no mother, and somewhere out there, a daughter. He has been in and out of juvenile detention centers and it seems Jack’s family is his last shot. Like I said, it’s a quick read, but a powerful one. I sat in our front yard when I was finishing it. As I sat in my bag chair under our front tree, tears streamed down my face as I closed the book. I walked into the house and my husband said, “Aw. Did you finish your book?” I nodded. “Did you come in the house so the neighbor kids playing Pokemon Go wouldn’t see you crying in the front yard?” I nodded again. Orbiting Jupiter was easily my students’ favorite book of the school year, and they read a lot of book! We read three together as a class and they read a minimum of five more on their own, yet this one came up over and over again as we talked and discussed themes, characters, etc. In November I went to the NCTE and ALAN conferences that were held in Atlanta, and received a TON of free YA and Middle Grade books. 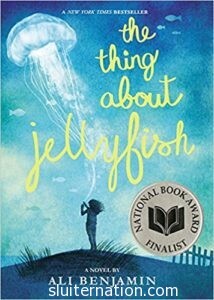 After finding The Thing About Jellyfish in my pile and hearing Ali Benjamin speak about writing about loss, I knew this one needed to be on my To Read pile. My only regret is that I waited until summer to read it rather than reading it during the school year so I could book talk it; it sat untouched on my classroom library shelves all year. That will change this year! I think about my hair, about the tangles I battle every morning. I have spent so many hours of my life trying to brush out tangles. But no matter how carefully I try to to pull the individual strands apart, they just get tighter and tighter. They cinch together in all the worst ways, until they are impossible to straighten out. Sometimes there is nothing to be done but to get out a pair of scissors and cut the knot right out. But how do you cut out a knot that’s formed by people? This one was suggested to me by a student. It’s another one that I received at ALAN and although I hadn’t read it yet, I put it out with my LBGTQ display. It was quickly picked up and loved and recommended to me. 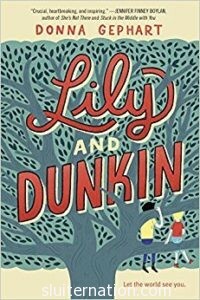 This is a dual narrative book and almost reads like both Lily and Dunkin are writing in a diary of sorts. Lily begins the book. She is a girl who was born with boy parts. She is going into the 8th grade and hoping the bullying and harassment stop this year. She is hoping her parents agree to getting her hormone blockers. She struggles with being Tim at school, but knowing she is really Lily. Dunkin is the new kid in town. He and his mom moved down to Florida to live with his Grandma (who he calls Bubbie) after something happened with his dad who struggles with bipolar disorder. Dunkin’s real name is Norbert, but he hates that name. Dunkin also struggles with bipolar disorder, but doesn’t want anyone to know about it. He just wants to fit in for once and he thinks he has found the way to do that: by joining the basketball team. The problem is, if he wants to be popular and well-liked, he can’t be seen hanging out with Lily. They both have a secret and are not sure they can trust each other. All three of these books are quick reads; I think I read each in just two or three days. But they each really stick with you. They all have an element of loss in the form of death, but they also deal with loss of friends and the naive childhood that is enjoyed before the turbulent middle school years. I’m excited to be able to book talk these right off the bat when we start school in a few weeks.